PRACTICAL AUSTRALIAN Motorist Book. PRINTED IN THE 1950s. Bruce Elder. THE MAGIC OF AUSTRALIA. South Australia. Western Australia. Hard Covered Book in Good Condition with Dust Jacket. ~~ FULL OF INFORMATION ~~. Printed 1995. Blake L. J. Pioneer Schools Of Australia. Book and Jacket are both in Very good condition throughout. There Had To Be More To Colonising Australia Than Carving Out Towns And Livelihoods From Virgin Bush. TOOWOOMBA IS A GARDEN by June Kelly. there is no long waiting for this item. Sarah's Preloved. Pages - 56. Folklore of Australia. Since then, Australians have added to their own folklore, for the subject is an ever growing thing. Introduced by Walter Stone. Printers And Politics by J Hagan. First edition;, 1966. No Binding. Book Condition: Fine. pages 386, index; b/w plates, line illustrations; hardcover; good condition. A History of the Australian Printing Unions. 1850-1950 Outlines the struggles of the various Australian printing unions during their first hundred years, through economic depression, war and technological revolution. A Illustrated Encyclopaedia Of Australian Wilrdlife. Full title: A Illustrated Encyclopaedia Of Australian Wilrdlife. BZDB43 NOAMZ Australian::Australian Fauna; Animals & Birds; A Illustrated Encyclopaedia Of Australian Wilrdlife. A lively and fascinating history of activities along the Brunswick River in Northern NSW, taking in the towns of Mullumbimby and Brunswick Heads. Jim Brokenshire -The Brunswick: Another River and its People. AUSTRALIAN SHOWBIZ. THE ILLUSTRATED ENCYCLOPAEDIA OF. 1 ST EDITION 1984. CONSULTANT EDITOR ALAN VEITCH. The Diaries of Sarah Midgley & Richard Skilbeck. 25.0 x 14.0cms, 208pp, b/w illusts, very good hardcover & dustwrapper Sarah Migley's migrated to Australia with her family in 1851 and Richard Skilbeck, her cousin, went there 7 years later. They married bu Sarah died in 1861 and Richard stopped writing his diary in 1864. LARGE FORMAT FIRST EDITION HARDCOVER PUBLISHED BY GILLINGHAM PRINTERS, ADELAIDE, 1990 FOR THE SIDE-SADDLE ASSOCIATION OF SOUTH AUSTRALIA. 333 PAGES AND WELL ILLUSTRATED WITH DRAWINGS, PHOTO PLATES AND ARTWORKS. Sunny Memories Australians at the Seaside by Lana Wells. Book Condition: Near Fine. Dust Jacket Condition: Very Good. First Edition. 183 pages. Dustjacket has minor chipping. Auctiva's FREE Counter. Hard Cover. Book Condition: Very Good. Dust Jacket Condition: Good . 520 pages with b/w illustrations. Size: 8vo - over 7¾" - 9¾". Our Australian Kelpie ~ Tim Austin & Pieter Zaadstra. HbDj SCARCE in MELB! Illustrated Pieter Zaadstra. No discernible shelf wear to the dustjacket or crimson boards, the interior is tight and spotlessly clean with 128 glossy pages and is profusely illustrated by Dutch artist,Pieter Zaadstra. Shire of Carnarvon Hardcover in Dustjacket 64 Pages 1984. Reflections of a Country Town. I have many interesting, unusual and out of print books for sale. IMAGES OF BRADMAN. RARE & FAMOUS PHOTOGRAPHS OF A CRICKET LEGEND. 34cm x 25.5cm. Graham Pizzey. STORIES OF AUSTRALIAN BIRDS. Extract from Reflections on the Colony of New South Wales. many many more Stories. Illustrated with Black & White Sketches. Hard Cover Book with Dust Jacket in Good Condition. Life in the Australian Backblocks by Edward S Sorenson. Hard Cover. Book Condition: Very Good. Dust Jacket Condition: Very Good. Illustrated Edition. v, 152pp, num bw ills. Or brown cloth in jacket. Spine slightly faded. Originally published in 1911 this is a collection of vignettes depicting bush life in Australia. A-Z Of Australian Towns & Cities. to 1500 towns and cities. By Robert Wilson. The Illustrated. Size 28.5 x 17 cm. and cardboard. A must for any serious Australian art book collection. Occasionally they take longer than this. We photograph all our books and patterns so you can see exactly what you’ll receive when you order from us. The Sleepy Bear Books Difference. We Make a Difference. THIS BOOK WAS THE RESULT OF A COMPETITION BY THE STATE'S LEADING RURAL NEWSPAPER WHICH SOUGHT PHOTOS, SHORT STORIES AND POEMS FROM ITS READERS. THIS IS THE RESULT. THUS, A LITTLE MORE THAN JUST A PHOTO ESSAY. Philip Cox & Wesley Stacey. HISTORIC TOWNS OF AUSTRALIA. South Australia. Western Australia. Illustrated with Black & White Photographs. Hard Covered Book with Dust Jacket in Good Condition. ~~ FULL OF INFORMATION ~~. Australian Geographic Hardcover in Dustjacket 224 Pages 2012. It was once out only major highway. AUSTRALIAN BANK DEPOSIT : to Newcastle Permanent. HIGHWAY ONE. I have many interesting, unusual and out of print books for sale. Harry Frauca. AUSTRALIAN REPTILE WONDERS. Illustrated with Colour and Black & White Photographs. Hard Cover Book in Good Condition, with Dust Jacket. ~~ FULL OF INFORMATION ~~. Goannas or Monitor Lizards. By Bill Wannan. Legendary Australians. Published 1974. Hardcover And Dust Jacket. A panorama of the colourful side of life. In card board with bubble wrap. when combining orders. books or magazines. Complete Book of Australian Folk Lore by Bill Scott. Book Condition: Very Good. William Neville "Bill" Scott OAM (4 October 1923 – 22 December 2005) was an Australian author, folklorist, songwriter, poet and a collector of bush ballads and Australian folk history. 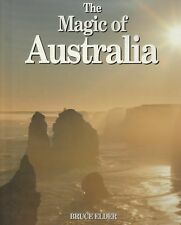 SPECTACULAR AUSTRALIA ~ KEN STEPNELL ~ DALYS NEWMAN ~ 2000 ~ 1st Edition ~ HC. Photographs By: Ken Stepnell. Text By: Dalys Newman. Spectacular Australia. Edition: 1st. Publication Year: 2000. Publisher: Murray David Publishing Pty Ltd NSW Australia. The pages and binding are tight, bright and clean. 563 colour photographs, 131 superb paintings cover every known species of Australian birds. Each bird is shown in natural surroundings. Every illustration gives clear detail of colour, plumage, beaks, and other aids to recognition. By Bill Beatty. Australian Folklore. A Treasury Of Australian Folktales. Nicely illustrated book. Hardcover And Dust Jacket. and see condition report. Large Format. In card board with bubble wrap. THE PICTORIAL HISTORY OF AUSTRALIAN HORSE RACING by Jack Pollard (Hardcover/Dust Jacket, 1971). AUSTRALIAN HORSE RACING by Jack Pollard. THE PICTORIAL HISTORY OF. Books n Bits. Paul Hamlyn. This comprehensive craft book includes 120 of the most popular projects covering all the favourite crafts. Areas include - needlework, soft toys, patchwork, quilting and applique, crochet and tatting, kids knits, paper crafts, folk art painting, stencilling and marbling and other crafts such as jewellery, plaiting, French knitting and fabric painting. (Weight: 730 gms). A rare larger size hardcover book in very good condition, it contains 261 pages with photos, and was published in 1997. See above for Contents. Baglin Mullins Hurley. A TREASURY OF AUSTRALIAN WILDFLOWERS. Australia's Wildflowers. Australian Wattles. Australian Eucalypts. Australian Banksias.